The first major boxing event of 2018, Road to Undisputed, is a heavyweight unification match set to take place at Principality Stadium in Cardiff, Wales, on March 31st. There’s plenty on the line for this one, including Anthony Joshua’s IBF, WBA (Super) and IBO heavyweight titles and Joseph Parker’s WBO heavyweight title. 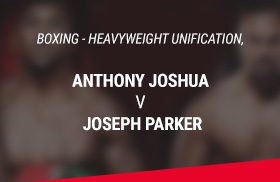 Joshua and Parker will not likely take to the ring before 2230hrs, though no official information is yet released as to the exact time the fighters will be walking to the ring to start the match. Anthony Joshua’s promoter, Eddie Hearn of Matchroom Sport, offered an 80-20 split to Joseph Parker’s camp, but since the fight is taking place in the UK, which favours Joshua, this was seen as disrespectful, and the deal would have to be improved, or Parker would fight someone else, such as Lucas Browne, Bryant Jennings, or Alexander Povetkin. Joseph Parker’s promoter, David Higgins, was able to negotiate a split from 30-35%, and if Joshua should lose, Parker would get a 55% split in the potential rematch. The fight was announced on January 14, 2018. Live on Sky Sports Box Office, and Showtime in the USA, the Road to Undisputed heavyweight unification was officially on for March 31st, at Principality Stadium in Cardiff. Anthony Joshua is the clear favourite, at 1/10. “AJ”, as he is commonly known, from Watford, England, standing in at 6 feet and 6 inches, has a record of 20-0 with 20 knockouts. Joseph Parker’s odds are currently 6/1 to win, or 20/1 for a draw. From Auckland, New Zealand, standing in at 6 feet and 4 inches, Parker has a record of 24-0 with 18 knockouts. Both fighters box in the Orthodox style. Parker underwent successful elbow surgery in November 2017. The previous undisputed heavyweight champion was Lennox Lewis all the way back in 1999. This contest is expected to rake in about £35 million. So What Next for the Winner? With four major belts within the heavyweight boxing division, WBA (Super) IBF WBO WBC, the winner of the Joshua v Parker bout will hold three -WBA (Super), IBF and WBO. The missing belt is that held by Deontay Wilder (WBC) so a historic unification could be only two fights away with no one ever holding all four of the belts at the same time! So history beckons, will Anthony Joshua continue on his road to unifying the division and realising his dreams or will it be Parker, What is certain Fight Night is going to be a cracker! Find knockout value on boxing odds from bouts located all over the planet you are in the right corner at BetVictor. Top Prices on Round Betting markets and other popular boxing betting markets that include Method of Victory, Total Rounds, Round Group Betting and Will The Fight Go The Distance. #PriceItUp Offer – You can request your own desired bet using the #PriceItUp hashtag on Twitter, BetVictor will then do their best to feature it as a special market, listing it alongside requested bets from other boxing fans. Online boxing betting with 10Bet where you get live betting Boxing odds!